This dataset contains the data used to calculate the Global Hunger Index (2017) for the years 1992, 2000, 2008 and 2017. 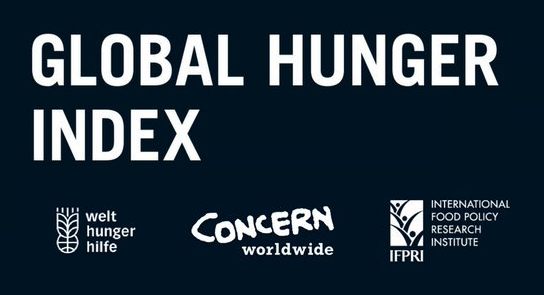 The Global Hunger Index (GHI) is a tool designed to comprehensively measure and track hunger globally, regionally, and by country. Each year, the International Food Policy Research Institute (IFPRI) calculates GHI scores in order to assess progress, or the lack thereof, in decreasing hunger. The GHI is designed to raise awareness and understanding of regional and country differences in the struggle against hunger. Note: In order to have numeric data for all observations, in the cases where the value was '<5' it has been transformed to '2.5'. The mortality rate of children younger than the age of five (partially reflecting the fatal synergy of inadequate dietary intake and unhealthy environments). The proportion of children under the age of five who suffer from stunting (that is, low height for their age, reflecting chronic undernutrition). The proportion of undernourished as a percentage of the population (reflecting the share of the population with insufficient calorie intake). The International Food Policy Research Institute (IFPRI) provides research-based policy solutions to sustainably reduce poverty and end hunger and malnutrition in developing countries. Established in 1975, IFPRI currently has more than 500 employees working in over 50 countries. It is a research center of theCGIAR Consortium, a worldwide partnership engaged in agricultural research for development.